Since the Forex Blog last covered the Canadian Dollar – on July 29 – the Canadian Dollar appreciated another 2% against the US Dollar, reinforcing the perception that the currency is both too volatile and appreciating too rapidly. This concern is harbored by the Central Bank officials and policymakers, which fear that the rising currency represents the proverbial wrench in the Canadian economic recovery. From a volatility standpoint, it looks like their concerns are justified. “For years it was traditional for the cost of a one-week option on the Canadian dollar to be 20 to 25 basis points…The cost is now commonly in the 50-point to 75-point range and in the last six months it has been as high as 100 points.” On a relative basis, the currency is also more volatile than the commodities with which it is commonly associated. In the last two months alone, it recorded both a 7.4% plunge and a 10% rise. To be fair, short-term volatility is lower than it was one year ago, but this isn’t going to placate those who insist that it’s still too high. 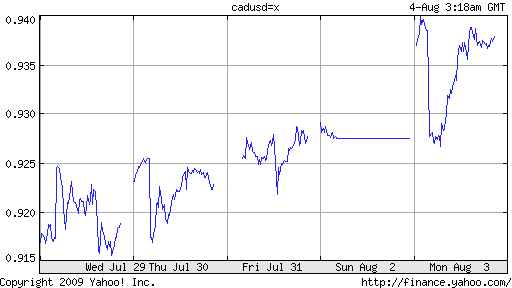 Looking at the charge that the Canadian Dollar has risen too rapidly, this too appears valid. One could argue that the thundering 20%+ rise since March was simply a retracement (in FX terminology), necessary to offset the even bigger decline that took place following the onset of the credit crisis. This argument, however, ignores the notion that the Loonie was probably overvalued before it fell. At that time, commodity prices were sky-high, and expectations were that they would remain high, if not soar even higher. Since then, they have fallen precipitously, to less than half of the record highs recorded during the peak of the bubble. Speaking of commodity prices, “At the time of its [the Bank of Canada’s] last statement, oil prices were about $75 a barrel, but now they are in the $60-to-$65 range. That suggests the currency’s appreciation has outpaced the demand for its commodity exports.” In other words, the Loonie’s recent rise can be attributed more to speculation, than to a change in fundamentals. “The rise in the dollar reflects ‘hot money seeking alternatives to the greenback,’ not the underlying economic strength,” agrees one analyst. The Bank of Canada, naturally, views this as a problem, and “Bank of Canada Governor Mark Carney says he is prepared to intervene in currency markets if the Canadian dollar’s rise persists and threatens to smother the ‘nascent’ recovery. If not for the uncertainty surrounding the Loonie, in fact, BOC officials are quite confident that Canada’s economy would grow consistently in the near-term. The Central Bank’s options are limited, since its main policy rate is already close to zero. This can still be tweaked, explains one analyst. “If you thought you were going to tighten in the first half of 2010 and the currency shoots to parity at some point, maybe that means you don’t get there until the end of 2010.” The bank’s only other monetary policy option is qualitative easing (i.e. printing money), which at this point in the cycle, seems unlikely. “Intervening in currency markets to quell the Canadian dollar’s strength is also an unattractive option for the bank, which views intervention without accompanying monetary policy action as ineffective. That leaves commenting on the currency as the only really agreeable option for the bank.” However, given that the Loonie has continued to appreciate in spite of Carney’s warnings, it seems traders have disregarded these threats as mere idle talk. To parity we go!